A Linerunner in GTA III. 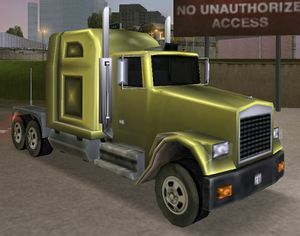 It is the only vehicle of its type in all of the games, except in Grand Theft Auto: San Andreas, where it is supplemented by two other semi-trucks. It is replaced by the Phantom in GTA IV. The Linerunner is design as a typical American standard cab-styled semi truck with an extended drivers' cab quarter. The truck remained largely similar throughout its appearances, with the exception of the radiator grill design, among other minor cosmetic changes. The name sounds like a parody of Freightliner, and its design resembles a Kenworth W900L with a shorter pointed grille in GTA III and GTA Liberty City Stories. The grille is taller and flattened in the subsequent games. The Linerunner's performance is what would be expected for a vehicle of it's size and weight, it's slow to accelerate and hard to maneuver in tight spaces, but once it gets going it has a decent top speed. Disappointingly, though, it's not quite as strong as it's intimidating appearance and size would suggest, and it gets knocked around by other vehicles surprisingly easily; nevertheless, the truck proves effective breaking through police roadblocks, provided it is sufficiently speedy. The Linerunner's handling is fairly steady, but if the player does manage to roll it over it's very difficult to get it back onto it's wheels, due to it's height. Along with the Tanker and Roadtrain, the Linerunner in Grand Theft Auto: San Andreas can be connected to a trailer in order to haul cargo, and is used in the Trucking missions; with the presence of two new semi-trucks in GTA San Andreas, the Linerunner is also revealed to be the slowest and least powerful semi-truck of the three. It is also the smallest out of the three. In Grand Theft Auto: Vice City Stories, it can be easily driven and balanced on only one side, making it the easiest vehicle to get a two-wheel bonus in. The "Linerunner" name may refer to a person who snorts lines of cocaine. In GTA San Andreas, the default radio station is K-Rose. A Linerunner appears as a wreck in Rockstar North's Manhunt, and in its GTA San Andreas form in Manhunt 2. Truck Cab and Truck Cab SX, GTA 2 equivalents. Roadtrain and Tanker, GTA San Andreas equivalents. This page was last modified on 3 November 2012, at 22:03.